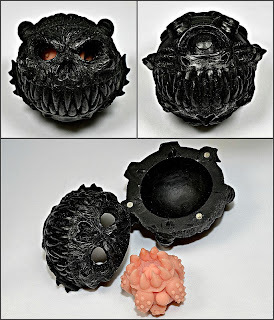 WHAT: One of the latest custom toy creations to come from Zectron, the Madball of Death takes inspiration from everyone's favorite crazy monster balls from the 1980s while adding an extra touch of twisted. As he did with his popular custom Critters-inspired figure and his Kesh-E-Face figure, here Zectron plays on the nostalgia so many people feel for a beloved '80s series in a majorly awesome way. The design features not only an outer rubber shell sculpted to have two different faces--an evil skull or an equally evil cyclops--depending on which way you turn it, but also the ability to be opened to hold a smaller rubber tentacled parasite figure inside. Produced through a collaboration with Tru:Tek, who casts these suckers up beautifully, the two halves of the outer shell are held together with small magnets so you can easily remove the parasite and then place it inside again when you're ready to send it back into its dark lair. I really love the ambitiousness of this toy as well as the creepiness of the general idea behind it--a formidable-looking monster shell housing an evil, tentacled mass inside, bent on destruction. What makes it even cooler is the header artwork Zectron teamed up with Ralph Niese to create, which depicts the ball baddies flying around in all their demonic glory on a planet apparently inhabited by buxom space babes. 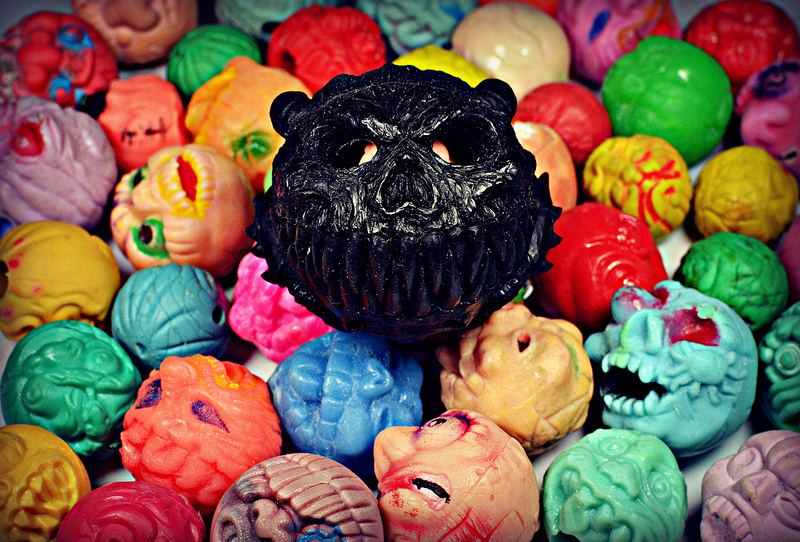 The Madballs of Death have already been produced in a few different color varieties, each one using a different color for the outer shell and the parasite inside (for example, a black shell with a neon pink parasite and vice versa, or a blue shell with an orange parasite and vice versa). Like the Critters-inspired keshi, this is one that I imagine most keshi and custom toy collectors are going to own at least one of--it's just that cool. 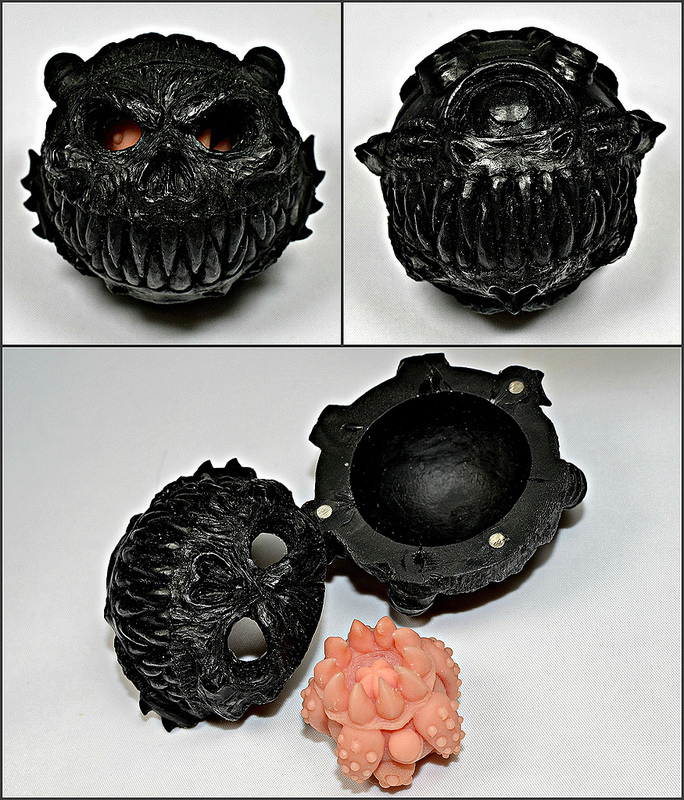 WHEN: The first versions of the Madball of Death became available for sale early in summer 2013. WHERE: So far, there have been a few different versions of the Madball of Death sold via man-e-toys.com / Tru:Tek, created for various conventions with remaining stock offered online afterward. Zectron and Tru:Tek are planning a general release for this piece starting in August. WHO: As mentioned above, the Madball of Death was designed and sculpted by Zectron, with production handled by Tru:Tek. I am sure they will do more soon. Can't wait to see what other color combos they come up with!